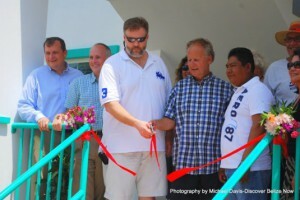 Grand Baymen Celebrates by Cutting the Ribbon! 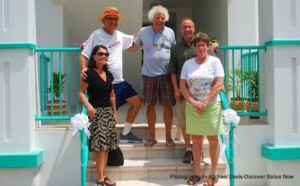 On Friday, March 22nd, Grand Baymen, located on Ambergris Caye in Belize, celebrated the Grand Opening of its first residential building with a ribbon cutting party! The event hosted over 50 people including proud condo owners, the Grand Baymen CEO Michael Cobb, President Eddie Littlefield, Construction Manager John Morgan, Joel Nagel, builders, suppliers, and many others who made the construction and opening of this building possible. 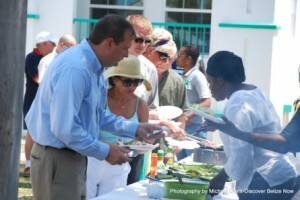 The party-goers enjoyed local cuisine from Robin's Kitchen, listened to live music, and eagerly participated in the cutting of the ribbon. Grand Baymen is a six acre garden property located only 150 meters from the azure Caribbean waters. It provides its owners with the comfort and luxury of North American standards at affordable prices. Owners and guests can enjoy the amenities that are already in place, including a 3-tier, 250,000 gallon pool, tennis courts, sand volleyball court, and a fitness center. 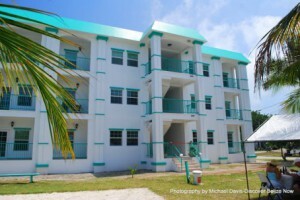 The brand-new residential building is home to twelve spacious, top-of-the-line 1- and 2- bedroom units. All units have beautiful full kitchens, large closets, balconies, and a washer and dryer. Out of the twelve units, only two remain and are looking for owners! Grand Baymen continues to grow; the land for the next building has already been cleared and construction started. This building will contain sixteen one-bedroom rental units, all of which will have a full kitchen and living room. As the site develops and more opportunities arise within the community, you have the ability to become a neighbor at Grand Baymen and enjoy the luxuries for yourself. The Grand Opening Ceremony of Building A brought the community together and highlighted the importance of patience, teamwork, and of course, having fun! Once again, Grand Baymen would like to thank everyone who has turned the Grand Baymen dream into a reality. All of your time, energy, and dedication has been recognized, and truly appreciated. Last, but certainly not least, welcome home Building Owners! Some of the proud Grand Baymen owners!